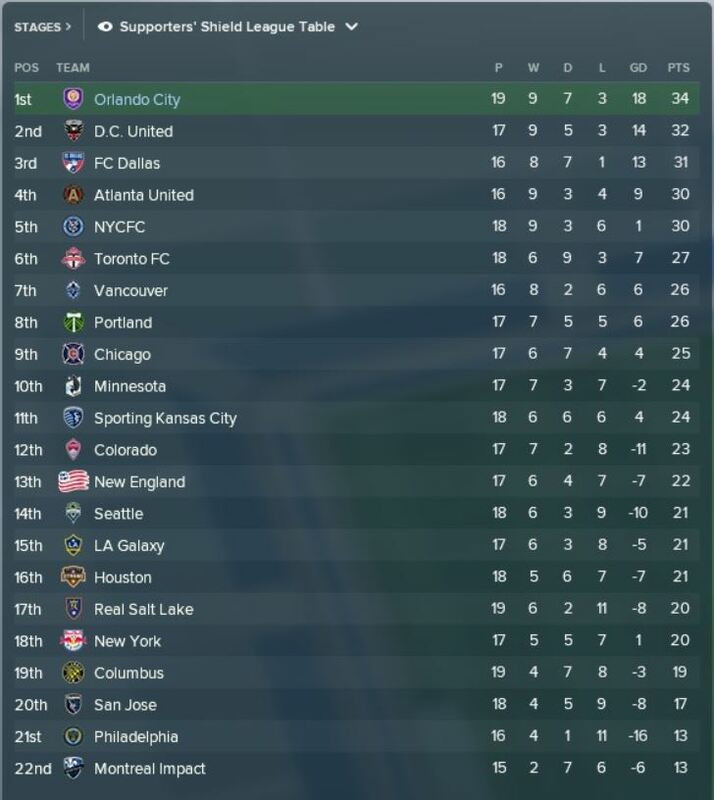 This is part six of an ongoing simulation experiment using Football Manager 18 to replay the 2017 MLS season to understand what went wrong for Orlando City. If you are interested, links to the first five posts will be link at the bottom. The virtual Orlando City continue to defy reality as they sit on top of the MLS Supporter’s Shield table at the end of June. The simulated Lions (which incidentally will be the name of my new indie-rock band) also handled their business in the US Open Cup to find their way into the quarter-finals. While the club went undefeated in June, racking up five wins and three draws, nothing came easy as the digital Lions came from behind in both games against the Chicago Fire to salvage a draw and struggled to beat the Charleston Battery, needing late game heroics from Dom Dwyer to save the team from extra time. I think this month the virtual club has been luckier than they have been exceptional. Which is an interesting intersection with reality, where I thought the flesh-and-blood Orlando City were unlucky at times. Oddest highlight might have been defender Scott Sutter forced into attacking midfield duty against the New York Cosmos, and ending up with two goals in the win. I’m not sure what’s going on. Obviously as a game, winning is fun. The only real difference I’ve made in terms of tactics is playing a 4-2-3-1, which I don’t recall actual coach Jason Kreis ever employing this past season. Beyond that, why we are winning? I can’t really figure that out. I should be really clear that I’m very acutely aware this is a simulation and should not oversell my abilities or be used as kindling for the #KreisOut crowd. I’ve been lucky a lot and I’m not managing for the long term. I’m not buying new players, the season started with the summer transfers in place, and I’m not worried about balancing playing time. I’ll making some larger conclusions once I wrap up this season, but as for now, I’m not totally sure why the club is doing so well. Due to schedule congestion I’ve been forced to go deep into the bench on a number of occasions. Add to that an injury to Will Johnson and the rotating cast of characters that pair up with Jonathan Spector in central defense, and I’ve been forced to use the entire roster, with 26 different players getting time on the field. In some cases this is working out well. Pierre Da Silva, P.C., and Dillon Powers have all played really well. Carlos Rivas is only half-way frustrating so far this season, scoring some important goals. Giles Barnes continues to confound his real life form with big goals in big games. Players like Richie Laryea and Jose Aja have not been as effective, with Laryea’s lack of form hurting my depth behind an often injured Kaka. This is where things stand for the moment, with Orlando on top of the table. The table looks about right when you compare it to real life, with a few significant differences. D.C. United are joining Orlando in defying reality at the top of the table, while MLS Western Conference Championship foes Houston Dynamo and Seattle Sounders are a bit lower than you’d expect. New York Red Bulls and Columbus Crew seem a few spots out of place as well.